The agricultural development project ACCESO reduced greenhouse gas emissions (GHG) and led to net carbon sequestration due to perennial crop expansion.  Increased fertilizer use was a moderate source of emissions that was more than offset by reduced emissions from other ACCESOsupported practices, including improvements in soil, water, and fertilizer management, and in feed and grassland use by dairy cows.  Compared to conventional practices, ACCESOsupported activities reduced emission intensity (GHG emissions per kilogram of output) for carrots (-106%), cabbages (-99%), maize (-99%), and potatoes (-98%) compared to conventional production methods. Emission intensity increased due to greater fertilizer use for plantain (55%) and coffee (247%). Nash J, Grewer U, Bockel L, Galford G, Pirolli G, White J. 2016. 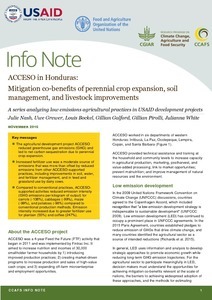 ACCESO in Honduras: Mitigation co-benefits of perennial crop expansion, soil management, and livestock improvements. CCAFS Info Note. Copenhagen, Denmark: International Center for Tropical Agriculture (CIAT) and the Food and Agriculture Organization of the United Nations (FAO).